The Mercato Nuovo, the old Straw Market, was new compared the long lost Mercato Vecchio that once occupied Piazza della Repubblica. 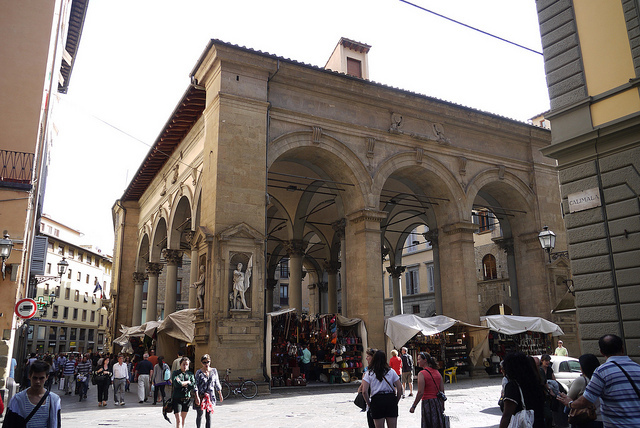 It bustles under a beautiful loggia built by Grand Duke Cosimo in the 1500s. Although you won’t see more than a wisp of straw these days, there is no lack of leather bags and belts, scarves, toys, umbrellas, embroidered linens and knick-knacks. In medieval times this was the merchants’ exchange, where any merchant who committed the crime of bankruptcy was publicly spanked before being carted off to prison; in times of peace it sheltered Florence’s battle-stained carroccio – the ox cart every medieval city took with it to war, bearing an altar and banners, that served to rally the troops. 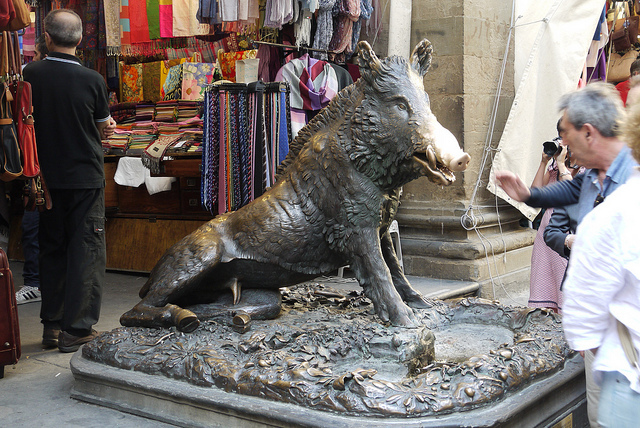 Florentines often call the market the ‘Porcellino’ (piglet) after the large bronze boar erected in 1612, a copy made by Pietro Tacca of the Hellenistic statue, given by Pius IV to Cosimo I in 1560 and currently in the Uffizi (the porcellino here is a new copy of the copy; Tacca's version is Museo Bardini). The drool spilling from its mouth reminds us that unlike Rome, Florence is no splashy city of fountains. Place a coin in its mouth, and if it falls into the grate at the bottom of the fountain you'll have good luck and rub the shiny snout so destiny will one day bring you back to Florence. The pungent aroma of the tripe sandwiches sold nearby may give you second thoughts. Images by: Richard, enjoy my life!